ShipTrack was conceived and created by a group of technology entrepreneurs in response to demand from companies and governments for real-time package tracking applications to electronically track items in transit in a simple, cost-effective manner. Whether the focus is on tracking the distribution of packages and envelopes by internal mailrooms, the delivery of shipments to the homes of online shoppers (last mile delivery) or the supply of controlled drugs to pharmacies, above all the ability to know where an item is and when it is delivered delivers a range of real-time advantages. Eliminating paper will directly affect your bottom line and improve your carbon footprint. International Data Corporation (IDC) estimates that employees spend 20% of their day looking for hard copy documents and don’t find what they’re looking for 50% of the time. Chain of custody tracking not only reveals where an item is at any given time but also whom had custody. For high value items such as scientific samples, health specimens and police evidence, the ability to ensure that they are in the same state from origin to destination is extremely important. If a chain of handlers is involved in its transport, the audit-ability of being able to identify who had custody of an item at any given time and location can ensure an item has not been tampered with or if it has who is accountable. 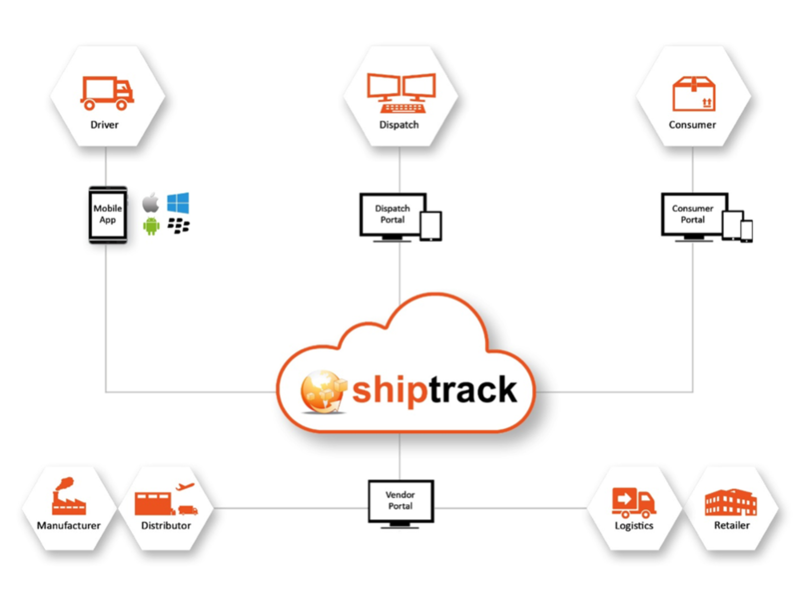 ShipTrack is a network platform that connects all stakeholders into one cohesive communications system. In addition to all of the overhead costs just associated with the processing, handling and storing of paper, organizations whose primary mission it is to move goods such as transportation and courier firms, expend substantial time and effort using difficult-to-scale manual processes. The competitive pressures and business growth opportunities servicing the demands of etailers’ delivery requirements necessitate a different more scalable approach to managing internal as well as field operations. The challenge of processing thousands or tens of thousands of delivery orders daily, using manual spreadsheets, can be a significant barrier to meet the growing expectations of ecommerce shoppers to receive their orders sooner and sooner. Dispatchers and delivery drivers need access to tools to alleviate the effort required to ingest, digest and distribute delivery orders in a collaborative fashion and in ever-increasing volumes. Electronic proof of delivery not only adds to savings in paper but also improves cash collection and reduces receivables by minimizing invoice delays. Better cash management has a high correlation with business growth and prosperity. The efficiency levels of many corporate mailrooms such as those in law offices can be improved by providing visibility of documents in transit from mailroom facilities to their addressees even if they are not present when deliveries are made. In large global corporations with multi-tiered document distribution facilities, visibility of documents in transit reduces mis-delivered items, identifies locations of items that have been re-vectored and improves overall delivery reliability. ShipTrack has been developed from its inception with the goal of delivering value to all transportation service providers, vendors, manufacturers and users (consignees) of transportation services. Service providers who use ShipTrack to track and manage deliveries not only enjoy reduced costs and increased efficiencies within their businesses but also help vendors who use their delivery services generate increased customer loyalty with faster, more accurate and more visible deliveries. Customers in many instances view the delivery of their online purchases as an extension of the vendor’s offerings. ShipTrack's online tracking portal is easy to use and delivers much more information than traditional courier trackers provide. The elimination of paper-based tracking and delivery schemes is a significant contributor to reductions in carbon emissions. ShipTrack was developed from its inception to be easily integrated into any existing I.T. infrastructure. For instance, customers can be up and running in a matter of hours. ShipTrack users require no servers, no IT staff and no maintenance or support costs. Above all, as a secure, turn-key, all-encompassing stand-alone solution, ShipTrack operates globally from the world’s leading hosting facilities. ShipTrack operates standalone and offers a series of integration operations to suit any existing legacy I.T. environments. Integration options range from fully-customized to industry-standard, information-sharing methods for instance such as EDI (Electronic Data Interchange) and CSV (Common Separated Values) file transfers. ARE YOU SHIPTRACK ENABLED?Sign up for a ShipTrack Demo!